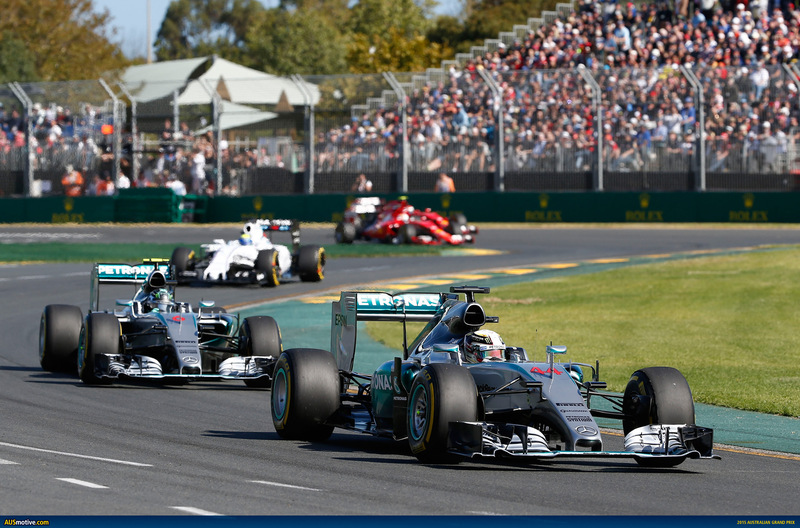 Lewis Hamilton has made a perfect start to his world championship title defence with a seemingly easy win at Albert Park yesterday. It was a funny week for Formula 1, with the Giedo van der Garde v Sauber saga dominating headlines, the return and then no show of Manor, Valtteri Bottas’ injury withdrawal and the failure of Kevin Magnussen and Daniil Kvyat to start after their cars died on the out lap before the race. Only 13 cars started the grand prix and it seems a miracle that 11 of them finished. The expectations were that more cars would run into reliability problems. In the end Hamilton defeated his teammate Nico Rosberg by 1.3 seconds. You sense Hamilton would have been able to hold off Rosberg if a serious challenge for lead was mounted. It wasn’t. Sebastian Vettel claimed the final podium step in his Ferrari debut, a few seconds ahead of Felipe Massa. The real winners, though, were Sauber who had their two preferred drivers finish strongly. Felipe Nasr marked his F1 debut with a fifth place and Marcus Ericsson came home eighth. Last year Sauber didn’t manage a single championship point, now they have 14 after just one race. Who knows what the courts will dictate for them in Malaysia and beyond, but after a terrible week that’s one team party that would have been a blast last night. The Toro Rosso kids had a fun time with the grown ups too. Sadly for Max Verstappen he was forced to retire, but Carlos Sainz finished in a credible ninth place. Jenson Button did finish the race in his McLaren. But he was stone motherless last, two laps off the pace, and the only finisher who didn’t score a championship point. It was valuable testing time for the struggling McLaren-Honda outfit. 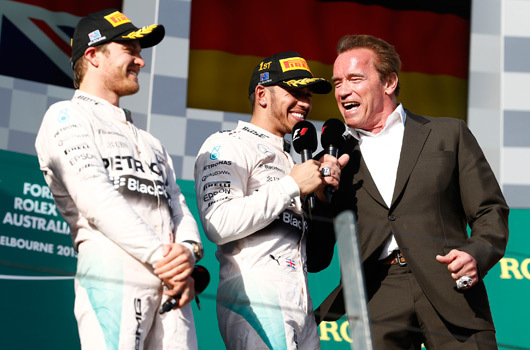 It’s easy to tell how boring this race was when the highlight was the post-race podium interviews conducted by Arnold Schwarzenegger. Yes, that Arnold Schwarzenegger! I had a shiver of horror go down my spine when Arnie was announced for fear that this interview would end in high farce. Fair dues to the Hollywood icon because either he has a clue or is a genuinely good actor and thankfully he handled the role well. So, who knew Arnie was a Formula 1 fan! There will be more exciting times ahead in this 2015 F1 season, but save from the sunny weather and mostly clean racing this was as dull as it gets for a season opener. Well done Lewis, well done Nico, well done Mercedes, you were just too damn good. I know its only been one race, to see Sauber in front of Red Bull is a rare sight. “I fear the interest will wane,” Horner said. “I didn’t see much of Mercedes on the television and I can only imagine that it isn’t interesting watching a procession so the producer was looking for other battles going on in the race – except there weren’t that many cars to look at. The highlight for me was Arnie [Schwarzenegger] on the podium. And, well done Arnie! Before the race, I cringed as he seemed to not know any F1 driver’s names when talking to Network 10 but I dare say, he was being media savvy in that regard and not showing bias. Admittedly, I liked Queanbeyan’s F1 insights during the weekend on “Pleb TV” (FTA). Ricciardo had better start looking for a new contract, a second crap year in a row will not be something that Red Bull will take lightly.